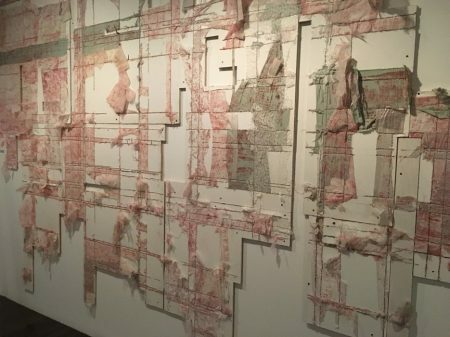 Like Shin’s body of work, Shinique Smith has developed a signature style and practice using bundles of castoff clothing in order to engage in dialogues about economies of waste and excess, and the agents driving these cycles. It’s a New Day from 2014 [Figure 9] is a bundle of fabrics suspended from the ceiling, calling to mind molecules, atomic structures, planetary systems, and gravitational forces. The title of another work, Progenitor (2016), further suggests this association with quantum and universal forces. What is more, these bales resemble the satchels of nomadic peoples in the developing nations from which Smith has sourced the bulk of her garments. Perhaps no artist’s practice better embodies one of the driving contentions of this exhibition, the contention “that disused, discarded objects, and quotidian gestures, accrue new meaning and value through the process of making art, demonstrating symbolic and literal reversals of the decay associated with ecological loss, and its entanglement with the geopolitics, culture, and safety of our planet.” Smith’s visual forms serve as apt metaphors in which to offer critical commentary on the material exchange of wealth and products in the global economy. Just as there are larger intangible forces or laws that govern the interaction of constituent parts at atomic and cosmic levels, so too are there hidden economic forces governing how the developed world interacts with the developing. Indeed, Smith is looking at how the global center relates to the periphery and all its invisible laborers. 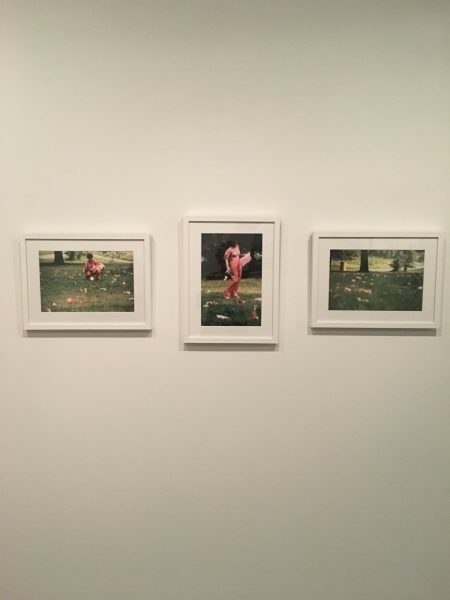 In this respect, Smith’s work is comparable to Laderman Ukeles, who extensively documented the unseen and often un-appreciated labor of thousands of New York City sanitation workers. It is also worth noting that the different designs on the found textiles suggest individual identities and personalities behind the patterns, linking the fabrics to those who produced them and those who once wore them. 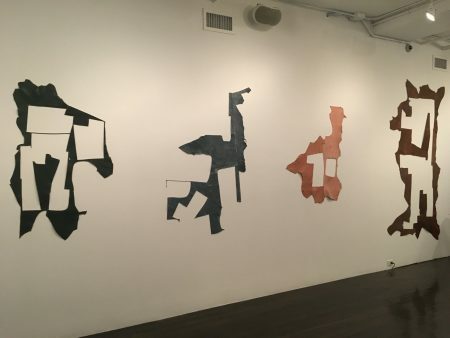 As one of the nearby text panels explains, much of “Smith’s raw material has been produced in the developing world, and continues to circulate the globe, crossing through different economic zones as recycled materials.” Smith’s work dovetails nicely with Jean Shin’s leather straps, which conceivably might be seen as mapping out these economic zones through her cut-out forms. 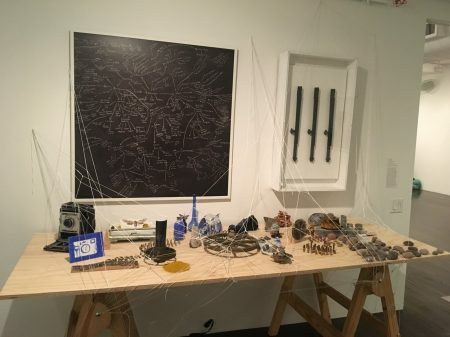 Both artists disrupt, intervene in the normal cycle of use and disposal in order to bring viewers in the developed world face to face with the waste of contemporary consumption habits and unravel the unseen power dynamics at play. 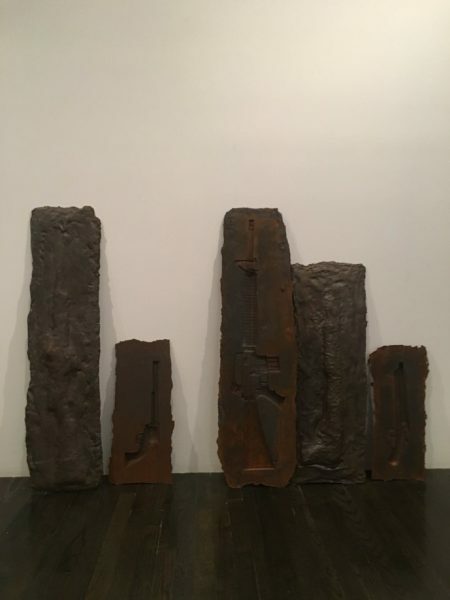 Roberto Visani, “several versos”, 2016. Cast iron, courtesy of the artist. 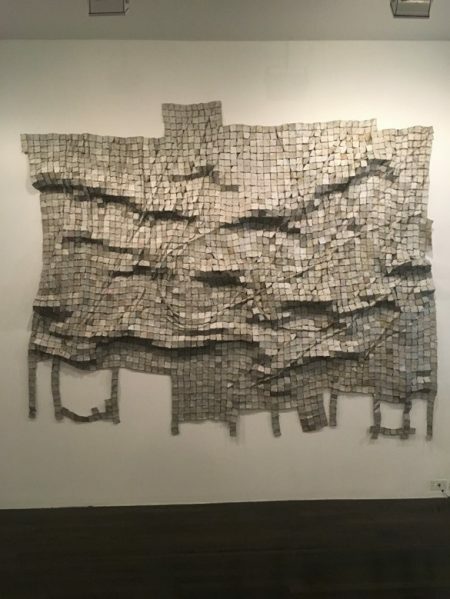 El Anatsui, “Metas II”, 2014. Found aluminum and copper wire, courtesy of the artist and Jack Shainman Gallery, New York. Michael Rakowitz, “May the Obdurate Foe Not Stay in Good Health”, 2016. 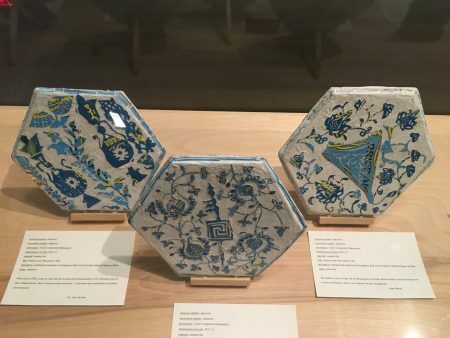 Syrian and other Middle Eastern packaging and newspapers, glue, courtesy of the artist and Jane Lombard Gallery, New York. Elana Herzog, “Valence”, 2014/2018. 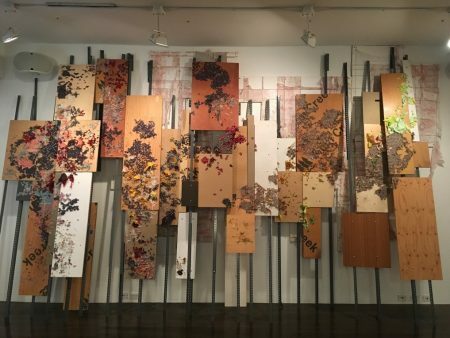 Wood, drywall, paint, textile, metal staples, steel shelving posts, hardware, courtesy of the artist. 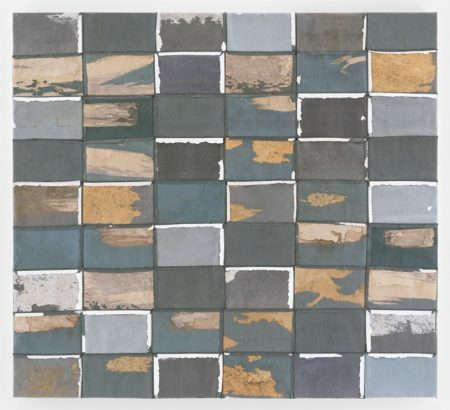 Elana Herzog, “Valence”, 2014/2018. Courtesy of the artist. Samuel Levi Jones, “Gris”, 2017. Deconstructed Ohio law books on canvas. From the Collection of Michael Hoeh, New York, NY. Courtesy of Galerie Lelong & Co., New York. Mary Mattingly, “Mineral Still Life (Cobalt and Nickel)”, 2018. Wood, fabric, paper, metals, minerals, glass, and plastics. Mary Mattingly, “Cobalt Map”, 2016. Chromogenic dye coupler print. Jean Shin, “Spring Collection (Look 14)”, 2016; “Spring Collection (Look 19)”, 2016; “Spring Collection (Look 20)”, 2016; “Spring Collection (Look 1)”, 2016. Leather remnants and upholstery tacks, courtesy of the artist. 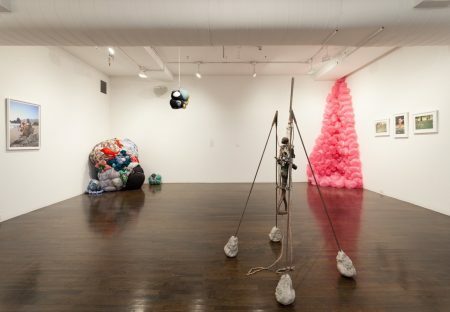 Shinique Smith, Installation shot of “It’s a New Day” (2014). Clothing, fabric, objects, ribbon and rope, courtesy of the artist and David Castillo Gallery. 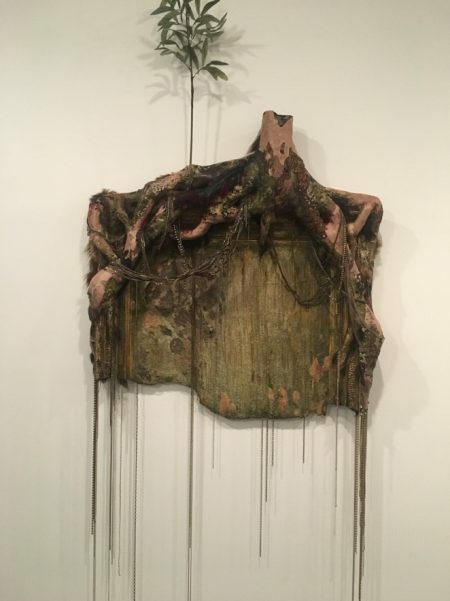 Lina Puerta, “Untitled (Tree and Frame)”, 2014. Concrete, polyurethane foam, reed mesh, wire, paint, fabric, lace, leather, faux fur, artificial moss and plant, gilded frame, chains, broken jewelry, feathers, flocking, Swarovski crystals, and beads. Courtesy of the artist and Faction Art Projects-Harlem NYC. Maren Hassinger, “Pink Trash”, 1982. Three inkjet prints, courtesy of the artist.